The Internet has changed everything. Long gone are the days when you picked up the Yellow Pages directory and looked for someone to help you with plumbing, car repair, or Mexican take-out. Now, it’s just a few clicks at Google or fire up Yelp on your mobile phone or tablet. When it comes to graphics design, specifically in this case logo design, an interesting alternative to consider may be crowdSPRING. crowdSPRING is easy-to-use and affordable. I’ve had several clients use it for logo design and they were very happy with the results, including Barry Frankel, a wedding photographer in Maui, Hawaii. Post your project and name your price. Then watch as dozens of talented creatives participate in your project and choose from an average of 110+ custom designs. 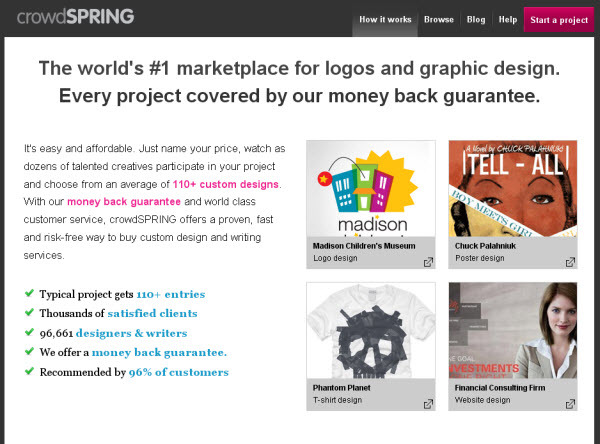 With a money back guarantee and world class customer service, crowdSPRING can be a proven, fast and risk-free way to have a new logo created for your company. You can find out more at http://www.crowdspring.com/how-it-works/. If you used crowdSPRING to have a new logo designed, or choose to use them, drop me a line and let me see your new logo! [Update: 01/27/12] I’d also add to this the http://www.99designs.com site. Several of my clients have used this site in the recent past and been very happy with the results.